Make your holiday season extra-special this year and do something important for bird conservation by participating in the Christmas Bird Count. Every year from December 14 through January 5 people around the world get outside and count the birds in their area or even just their yard. When you register and participate in the count, you are part of an organized counting of birds at a specific time each year and the information which you report is added to all the historical data from over 100 years of bird counts. The data supplies scientists with critical information on where birds are, the health of bird populations and helps direct conservation efforts. Plus, its lots of fun to do with friends and family! The origins of the Christmas Bird Count are interesting. In the 19th Century, there was an organized hunt called the Christmas “Side Hunt” where hunters would shoot as many birds as they could — the winner was the one with the largest number of birds shot. As people were slowly becoming more aware of what wanton hunting for sport was doing to populations of birds and animals, on Christmas Day 1900, Frank Chapman, the head of the magazine Bird-Lore (which became Audubon Magazine), proposed an alternative to the Christmas hunt with a Christmas bird count. And that Christmas, 90 species were counted by 27 people. Now, there are nearly 70 million birds reported and 75,000 people worldwide who participate – you can be one of them! It’s easy to do and a lot of fun! 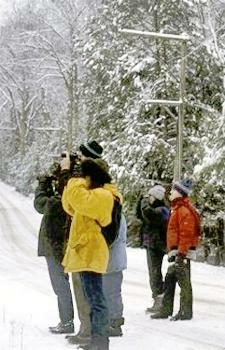 Won’t you join the longest-running bird citizen science project in the US this year? Registration takes place in November – don’t miss out!